When I think of the American Pine Marten (Martes americana), it invokes an image of giant, rotund spruces and hemlocks in an old growth forest. In my mind, the lithe body of a Pine Marten scurries around in the branches perhaps a hundred feet from the forest floor in search of a red squirrel or bird’s nest. A small squeak indicates that the small mustelid has connected with its prey. This vision could be considered “classic” in the fact that martens are strongly associated with mature, old growth forests (Greg 1995). In fact, their dependence on old growth forests is so strong that traditional logging methods have been cited as a driver of large scale declines of marten populations (Davies 1983). In some regions of Southeast Alaska marten are still abundant, and in general the Tongass National Forest offers great habitat for marten. However, they are most often found on the mainland, and I was told by a friend that they were introduced to Chichagof Island by people. That tidbit of information intrigued me, and as I dove into Pine Marten history on Chichagof I was very interested to find out a marten I crossed paths with is a descendant from a small introduction of intentional transplants. Transplanting wildlife to new areas in Alaska has been going on since the Russians began to settle here (Paul 2009). Frequently transplants happened on the Aleutian Islands or the islands of Southeast Alaska and often the incentive revolved around economic opportunity. A well-known example of this is the transplant of Blue Fox to the Aleutians so they could be farmed and harvested for trapping. The fox were responsible for extirpating several species of birds from the islands. Over the years many species including Caribou, Sitka Blacktail, Mountain Goats and Elk have been introduced to new areas throughout Alaska. The first martens were introduced to Chichagof Island in 1949 to create a population for trapping (in fact Pine Martens are still Alaska’s largest fur market earning 1-2 million annually (Alaska Department of Fish and Game)). By 1954, 21 marten had been introduced to the Island and despite the low number of starting individuals, their numbers climbed rapidly in their new environment. It is estimated in 2006 over 2,200 marten were trapped on Chichagof Island. It’s a remarkably successful population here! Since transplants can have negative effects on resident populations, did the transplant of marten to Chichagof Island impact populations there? Anecdotally I have been told that Dusky Grouse (Dendragapus obscurus) numbers have declined on the island and that Northern Flying Squirrel (Glaucomys sabrinus) are not as abundant as they used to be. Certainly each of these prey items are consumed by the martens. Buskirk (1983) found birds and squirrels made up a strong majority of the marten’s diet in Southcentral Alaska, but that voles, mice, and shrews were the most important items in the diet. On Chichagof Island, the diet patterns are the same, although Ben-David et al. (1997) found high variation in the autumn and the presence of salmon and crab. In the summer a marten’s diet may be made up 80% of birds and squirrels. Marten populations are normally not very large and hence would be unlikely to strongly influence prey, but Chichagof Island holds the highest abundance in the region (Flynn and Ben-David 2004). With these high populations and a diet favoring birds and squirrels, is it is possible that marten populations on Chichagof Island exert a top-down pressure on their prey? I believe based on the effect of being a successful transplant makes it it possible. However, I can find no data on the population trends of Dusky Grouse or Flying Squirrels on Chichagof Island and there are many other factors at play. For instance, Dusky Grouse may find protection from predators in old growth and flying squirrels are likely to benefit from old growth structure. Hence, removal of old growth by logging may lead to a reduced population. Rather than conjecture on a speculative answer, I will put it out there that a graduate student and the Alaska Department of Fish and Game could pair up on this venture. American Pine Marten on Chichagof Island near Hoonah, Alaska. I will leave you with a description of my encounter with an American Pine Marten. On October 16th, Hoonah received measurable snow before Fairbanks, Alaska. The 14 inches of snow that lay on the ground was the first time Southeast Alaska had beat the Interior to snow in over 70 years. I started up my truck, my wife jumped in, and we headed out the road with the hope of photographing a bear in the snow. The lower elevations were slick and wet. 6 inches of slush lay heavy on the roads, but we made it the 10 miles to the turn towards False Bay. As we slowly climbed the pass the truck seemed to shrink into the ground as the snow levels rose. After only a couple of miles we were plowing snow with the bumper of the truck and it was evident that we would not go much further. The only catch was we could not find a place to turn around. On we drove hoping that our luck held out, when up the road we saw a small figure bound into the ditch. It plowed into a snow drift and then burst back out again. In a flash I was out with my camera clicking away. Pursing my lips I made small rodent sounds which intrigued the inquisitive creature. Turning its head rapidly it dove back into a snow bank and emerged a few feet away. To me it seemed as if the little fellow was simply enjoying the snow rather than doing anything too serious. He wove in and out of cover, posed for me and eventually bounded into the woods in search of greener (or whiter) pastures. R. Flynn and M. Ben-David. 2004. Abundance, prey availability and diets of American martens: implications for the design of old growth reserves in Southeast Alaska. U.S. Fish and Wildlife Service Grant final report. Alaska Department of Fish and Game. Ben-David, M., Flynn R.W., Schell D.M. 1997. Annual and seasonal changes in diets of martens: evidence from stable isotope analysis. Oecologia. 111:280-291. Buskirk, S.W. 1983. The Ecology of Marten in Southcentral Alaska. Doctoral Disertation. University of Alaska Fairbanks. Davis, Mark H. “Post-release movements of introduced marten.” The Journal of Wildlife Management (1983): 59-66. Drew, G. 1995. WINTER HABITAT SELECTION BY AMERICAN MARTEN (Martesamericana) IN NEWFOUNDLAND: WHY OLD GROWTH?. Dissertation. Paul, T. 2009. Game transplants in Alaska. Technical bulletin #4. 2nd Edition. For the last 2.5 years in fulfillment of my Masters in Wildlife Biology at the University of Alaska Fairbanks, I have been researching the biological and human component of two key moose hunters (wolves and humans) within the Yukon Flats. I am happy to say that the full thesis is is completed and that I will be graduating in December! In my eyes, a critical next step is to make the results of this work public. Hence, I will be dedicating four blog entries to the subject. This first installment will introduce the biology of the region, study area, and my research questions. My next installment will examine access of subsistence hunters to moose within the region. Following that I will look at movement of wolves in the region, and I will conclude by looking at areas were the likelihood of competition between wolves and humans for moose is highest. I conducted my research on human hunters and wolves in the Yukon Flats, Alaska. The predator-prey relations in Yukon Flats are unique because wolves and subsistence users pursue low-density moose that are held at a low-density equilibrium from predation. In fact, moose are at some of the lowest densities in the world (<0.20 moose per square kilometer). How do human hunters and wolves utilize their environment when pursuing moose? How does understanding space use and movement and of humans and wolves pursuing moose help us understand competition for a scarce resource they rely on? The Yukon Flats National Wildlife Refuge is located in central Alaska, and extends nearly 220 miles east to west and 120 miles north to south. It falls directly into a the boreal forest, which means if you walk around that you’ll find birch, black spruce, white spruce, alder and willow. Its namesake is the Yukon River which bisects the Flats, and the huge watershed of the Yukon River is fed by a plethora of rivers. In short, it is a water dominated system. The Yukon Flats National Wildlife Refuge is located north of Fairbanks. It extends nearly 220 miles from east to west and 120 miles north to south. Within the Yukon Flats there are several communities that are defined by their reliance on the land to harvest food, fuel, and fiber. Their subsistence lifestyle provides up to 85% of the resources they use including but not limited to moose, fish, and waterfowl. Since moose are such low densities but are critical for humans and moose, it is interesting to research how moose are pursued, and where the likelihood of competition between humans and wolves in the highest. Answering any of those questions pertinent for managers. My thesis integrated spatially explicit (i.e., locations) datasets of moose (Alces alces) hunters and of wolves (Canis lupus) to ultimately evaluate how two predators pursue a common resource, moose. To this end, Chapter 1 of my thesis will be the second installment on this blog and focus on quantifying rural hunter access in the Yukon Flats, Alaska, through spatially-linked interviews. I chose this research topic because previous studies have only qualitatively surmised use area for subsistence resources by drawing boundaries around use areas. However, a quantitative approach can yield firmer management information. My novel approach provided pertinent insight into resource use for our system and created a method that may be applied to other systems. Using results generated from subsistence hunter interviews, I applied a model of access to moose hunting areas. Harvest reporting is low among the subsistence communities in our study, and from our results we generated an estimate of harvest based on game densities similar to the best data available on reported harvest. As such, my method may provide an alternative to, or supplement, harvest-ticket reporting. In Chapter 2, I characterized movement paths (i.e., hunt paths) between moose kills by six packs in the Yukon Flats. The results of that work will be the third installment on this blog. The movements of wolves have been studied and documented in many high prey-density systems, but almost no information exists on their movements when prey is just dense (<0.20 /km2) enough for wolves to survive. Finally, I will tie what I learned about wolf movement and human access to examine where competition between humans is the most likely. At that time, I hope to provide a full copy of the thesis for comprehensive reading of the research. I look forward to sharing this information with you, please feel free to ask questions! Last night I did it again, and I enjoyed every minute of it. Yup, when I bring someone out for their first aurora and they are so excited that they can barely stand, I share in that excitement. Their grin is my grin and their joy is my passion. Their exuberance was warranted, as the aurora put on a beautiful show for us over the dogyards of Black Spruce Dog Sledding and for Alaskans across the state. It was hard not pull up one of the empty sleds that beckoned to the watcher to layback, relax, smile, and enjoy the show. It truly is a beautiful world. A Happy Trio under the Aurora! This image of empty sleds beckons the viewer to come take a seat and enjoy a beautiful show. The aurora creeps in over the Dog Yard of Black Spruce Dog Sledding. A powerful flare of aurora threatens to blow out this image. Such a beautiful scene! The aurora lights up the scene behind these snow-laden black spruces. I never leave out the horizon in my shots, but did in this one for some reason. And you know what – I kind of like it! The milky way is showing up alongside the aurora in this shot. Jason and Megan were visiting Black Spruce Dog Sledding, and I was more than happy to get an image of them under their aurora. A great couple! Wide vistas over Murphy dome showing off a beautiful sky. 2016 Alaskan Calendar is Now for Sale! I am very, very, very excited to write inform you of the release of my 2016 calendar! The content features some of the best imagery on this website, plus a few things that have never seen the “light of day”. The calendar is entitled “Seasonal Moods of Alaska” with imagery for each month captured in that month. The calendar is 100% designed by me including feature images, transparent images, windows, and text tying the imagery to the season. A huge thanks to my family and fiance for helping to proof the calendar! I believe the final product is a work of art mingled with science. The calendar is printed on 9.5×13 paper and spiral bound leaving ample of room to write in your schedule. Of course it has a hole for hanging if that is all you want to do with it! With imagery from throughout Alaska, the calendar is a great memento of your trip to Alaska, for a friend who has been here, or to bring inspiration for your future trip here! This calendar is being printed by my local shop in Perham, Minnesota. Your consideration and support also helping the local economy in Perham. Each month has a premier image. This image from Mendenhall glacier showcases the high resolution imagery within the calendar. Every month has a transparent image behind the grid, and small windows with images from that month. Writing in the lower right panel ties together fuses the imagery and writing together. The calendar will be available for pre-order through October 15th. At that time I will begin shipping orders. You can help me out a huge amount by spreading the word about this calendar or through a purchase! Thanks you so much in advance for your support in this project! Our trip had taken us from Fairbanks,Alaska up the Haul Road (Dalton Highway), over Chandlar Shelf, and peaked at Atigun Pass (4,738′). We traversed the valley on the north side of the Brooks Range, and explored as far as Toolik. Although we were on the tundra, we never went far enough to leave the Brooks Range out of sight. Because of the incredible backdrop the mountains provided, I was compelled to place what we observed in their natural habitat. 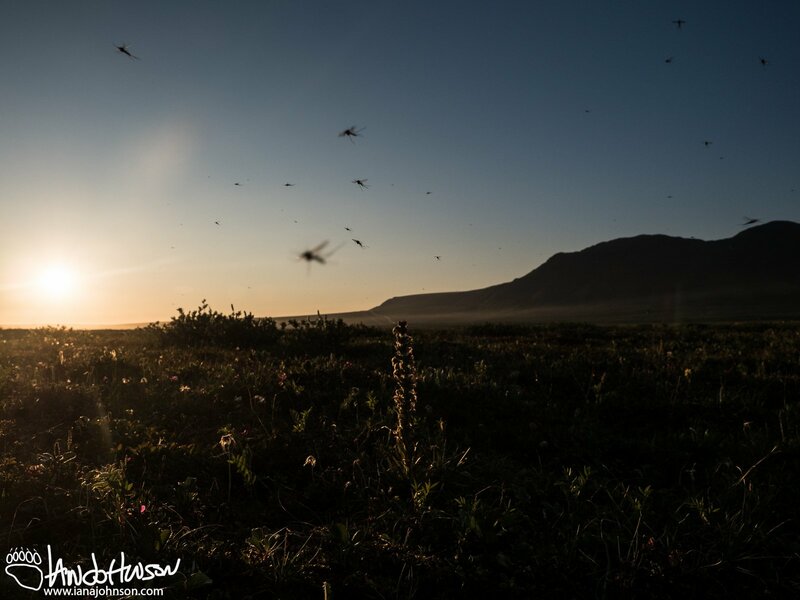 The resulting pictures and galleries provide a slice of diversity of the flowers and birds found on the tundra. One of the remarkable birds seen during the trip was a bluethroat. These awesome birds are one of a few species which winter in Asia, but breed on the tundra in Alaska. Due to the amount of migration time needed they spend a lot of time on the wing! When we found it with help from another birder, the male bluethroat was displaying in the air and calling out in the voices of many species. Bluethroats are almost perfect mimics, and as it sang out we could hear the calls of redpolls, gray-cheeked thrushes, and swallows in its repertoire. A bluethroat female will find this male attractive if it can mimic enough other birds. The video below captures a few of the calls of this unique and beautiful bird, and shows of its stunning throat! The northern hawk owl was another great bird of the trip. These raptors are efficient predators and unlike most owls are active during the mornings, evenings, and even during midday. This adaptation arose from the lack of nighttime in the tundra. The hawk owl we found was perched in the dead limbs of a burned black spruce, and actively twisted its head back and forth at every new sound. Suddenly the twisting head stopped, and it fixed its gaze on some unfortunate small animal on the ground. It dove off the branch with tucked wings, swooped low above the shrubs, but then perched again with empty claws. No breakfast this time! The second video below shows the intense stare of this bird. This American Golden Plover perched on this mound to survey the tundra. American Golden Plover surrounded in the mountains. This longspur chick perches in the warm sun on the tundra. This least sandpiper was found around small depression filled with water. A lapland longspur sits on a old stump in the solstice sun. Male rock ptarmigan leave the female after the eggs are laid, which is how we found this bachelor. A white-crowned sparrow fluffs up before carrying on with its food. A northern hawk owl fixes its gaze on some potential food. This northern hawk owl must have sat on a sharp stick! Although not the closest picture, the orange and blue throat patch of this bluethroat is stunning! Yellow, purple, pink, white, and red splashes of color were evident all across the tundra. Each color was associated with a pointed, rounded, tall, or stunted flower and stalk. The flowers of the tundra come in many different colors and shapes! Often the species are associated with a particular habitat type. Alpine arnica were found in the higher alpine tundra, arctic poppies in the short tundra, and bell heather tucked into the low pockets of the tussocks. One of the unexpected flowers of the trip were the frigid shooting stars that lined a small stream south of Toolik Field Station. Although I have wanted to see them for years now, I never thought the first time would be on the tundra! The flowers are aptly named, as their unique shape trails behind them as if they fell from the sky. I am about to sing the unsong of the mosquito because each bite from the armies of flocked, winged, beasts can cause doubt that they serve any purpose but to cause misery. However, during the trip I documented one of the mosquito’s greatest contributions to the ecosystem. In the tundra, bees and butterflies are not as abundant as they are in forested areas, however, as shown above the variety and abundance of flowers have to be pollinated by something! In step the buzzing, nagging, mosquito. Male mosquitoes do not feed on blood, but rather nectar and thus spread pollen. Their hunger ensures that the blooms of the tundra create seeds and propagate for the next year. A mosquito extends its proboscis peacefully into a pink plume to take a sip. It will carry pollen to the next pink plume it feeds on! A mosquito perches on a frigid shooting star. It serves as further proof that they like nectar meals, but also gives some scale to the shooting star flowers. They are not that big!